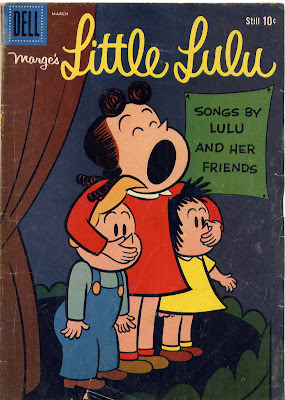 Little Lulu was the creation of Marjorie Henderson Buell (generally abbreviated to Marge). 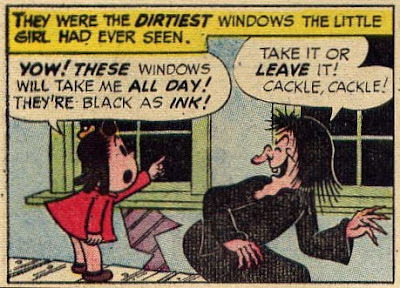 She appeared in the Saturday Evening Post in single panel comics for over a decade. 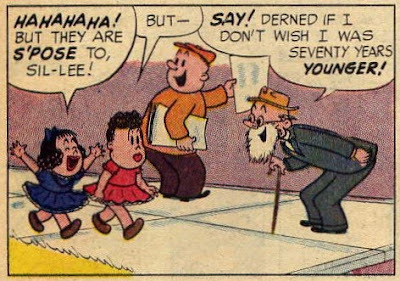 Later she got her own newspaper strip and eventually made it into the comics for Dell, which specialized in licensed characters. Dell hired John Stanley to produce the comics as both writer and artist. (Correction: As pointed out in the comments by Jonathan L. Miller, Stanley did the scripts and layouts only after the first few issues.) The result was one of the consistently funniest and entertaining books on the market. 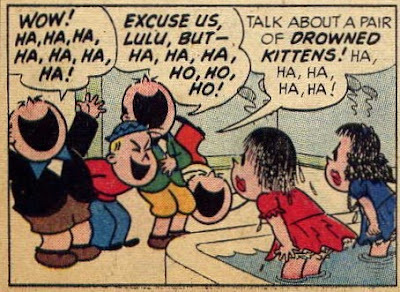 Along with Dennis the Menace and Richie Rich, Little Lulu was among the most successful comic book series featuring children ever; it was far more successful in that market than Charles Schultz's Peanuts. Part of the charm of the series lies in the two main characters. 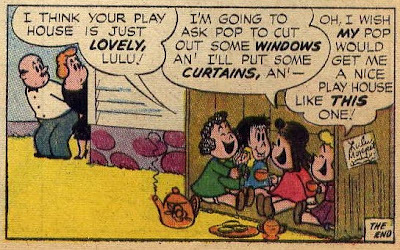 Little Lulu is (generally) the leader of the girls in her hometown, while Tubby, her sometimes friend and sometimes antagonist, bosses the boys. 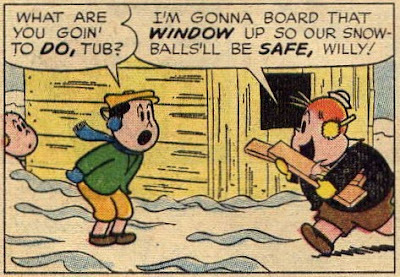 And with the window boarded up, the boys have a lot of hard work ahead of them to escape. 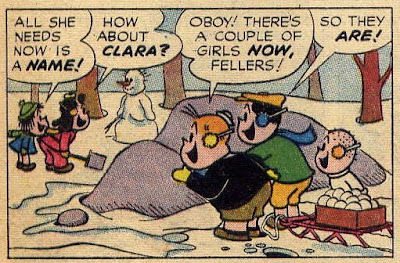 However, the boys have broken their vows not to talk to the girls, so they're all going to have to be sworn back into the club at some later date. 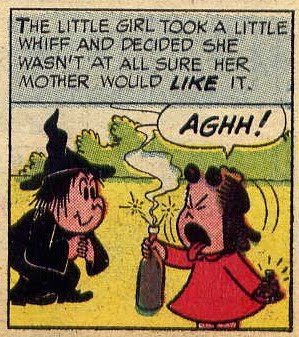 Note: the Mumday thing featured in several Little Lulu stories. 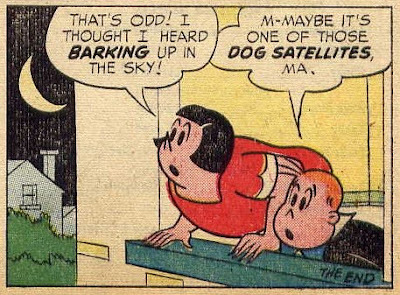 Probably another reference to Laika, the dog that the Russians put in space in 1957. 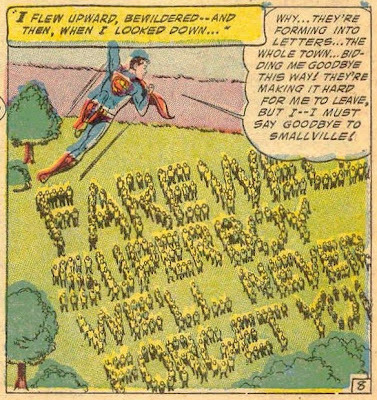 You also had Captain Marvel and Captain Marvel Jr., who was Elvis’ favorite comic book hero. You know the emblem with Elvis’ motto, “Taking Care of Business” with the lightning bolt? Captain Marvel Jr. had a lightning bolt on his chest, plus a little Elvis-like curl of hair in the middle of his forehead. 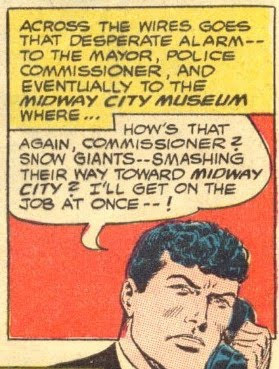 Elvis wore the jumpsuits with the high collar; Captain Marvel Jr. had a high collar. So while Jr. may not be as widely known as Captain Marvel himself, he had a profound effect on Elvis Presley. Well worth the read. 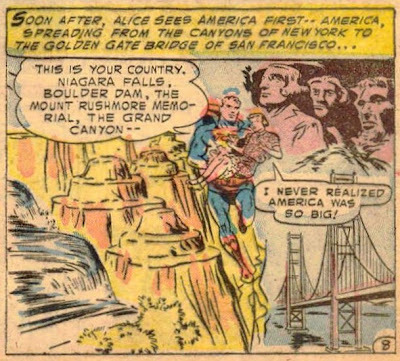 More fascinating discussion of DC's Golden Age era at Bill Jourdain's site in a podcast with the Comic Geek Speak guys. Out of This World posts the entire Jackie Johnson story from Our Army At War #160. You may recall that I reviewed that issue back in January. While we're on the topic of Our Army At War, Mykal posted the entirety of Our Army At War #120, featuring a pair of excellent stories including the origins of the Ice Cream Soldier, Wild Man, and Bulldozer. But it is the other story in that issue, a one-off tale featuring the Saucy Lady that really won my heart. All's fair in Love and War, right? 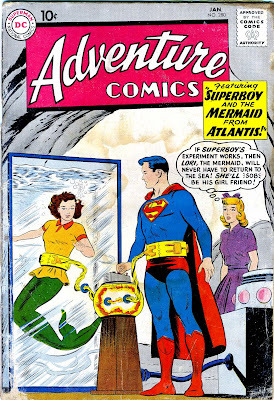 Jacque Nodell recently hosted a comics chatcast on the topic of Romance Comics, while Aaron from Silver Age Gold hosted one on his favorite comics. They are scheduled again on March 15 (Aaron) and March 16 (Jacque) at 8:00 PM eastern time, and this time I promise to remember to attend Aaron's. 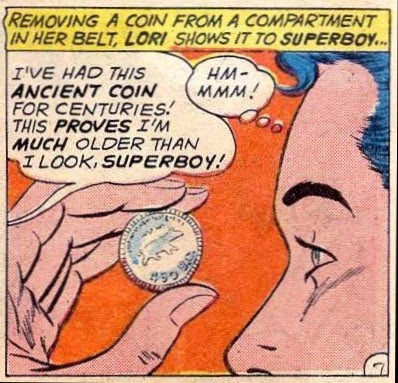 This story is symptomatic of one of the major problems with Superboy in the Silver Age. 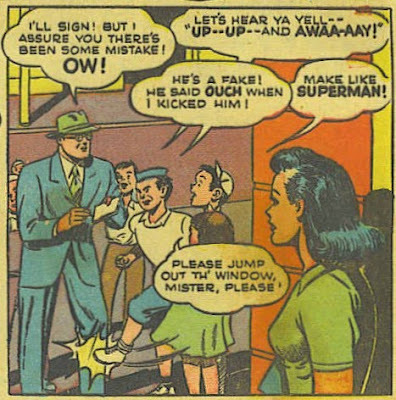 Characters that had been introduced in the Superman books often ended up appearing in Superboy, even though that appearance contradicted the Superman tales. 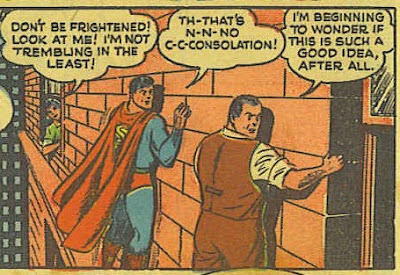 Lex Luthor, who for years had bedeviled the Man of Tomorrow, turned out to have been the best friend (however briefly) of the Boy of Steel. 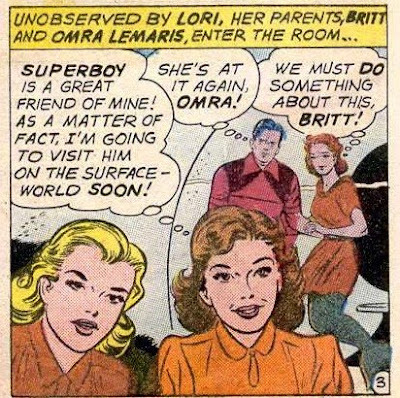 Lois Lane and Mr Mxyptlk also appeared in the Superboy chronicles, so it was perhaps inevitable that Lori Lemaris would also pop up in Smallville eventually. 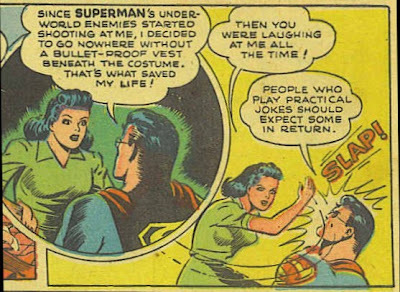 Never mind that we had been assured in her first Superman story that she was a girlfriend of his during his college years at Metropolis U. Of course, this was something of a cliche in the Silver Age; since BC means "Before Christ", nobody would have dated a coin 450 BC; that was the year applied after the birth of Jesus became considered a dividing point. 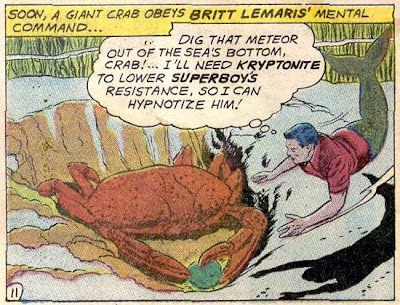 Yep, he hypnotizes Superboy, Lori, and Lana into having no memory of the incident. Comments: It's pretty obvious why this story has never been reprinted (as far as I know). 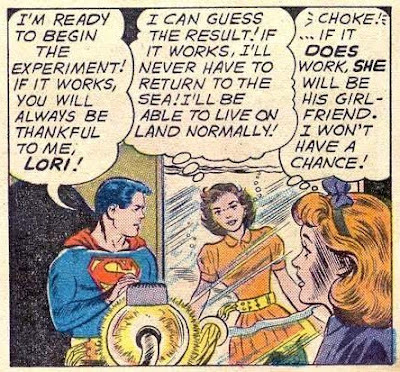 The details are weird, the hypnotism bit makes little sense (except to get Weisinger out of the problem of explaining why the story contradicted Lori's first Superman appearance), and Lori's compulsive lying puts her in a bad light. 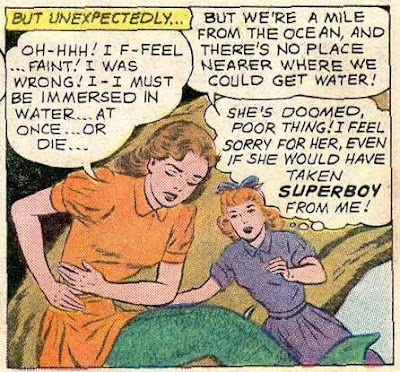 On the other hand, there is a rare good bit of characterization for Lana Lang, as she saves Lori's life despite fearing that Superboy will prefer the mermaid. 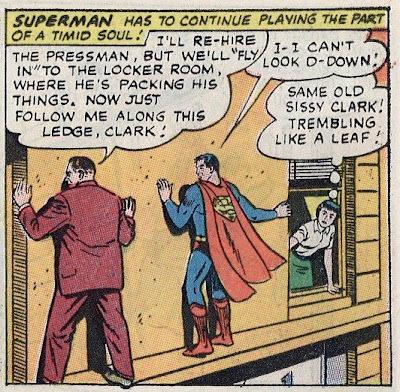 The story was dusted off and reused a few years later in a Superman story in Action Comics. The Aquaman story features Aquaman and Aqualad helping out with the TV show, Sea Chase. This is a reference to a popular syndicated TV show of the times called Sea Hunt, starring Lloyd Bridges and two of his sons, Jeff and Beau Bridges. One of the keys to Marvel's success in the Silver Age was the relentless use of crossover stories to introduce the readers of one Marvel mag to characters in other titles. This story marks the very beginning of that trend. 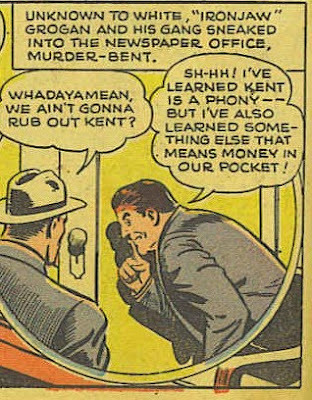 Banner's assistant, Karl Kort, drops his wallet, which conveniently contains a membership card in a "subversive communist front organization". 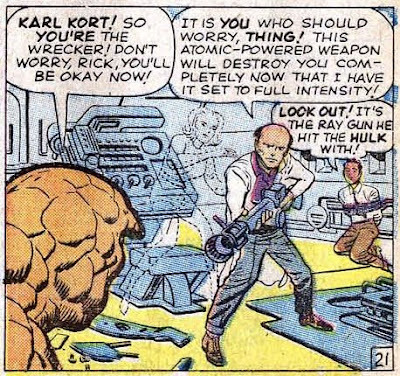 Thus the Wrecker's identity is revealed to Rick Jones. 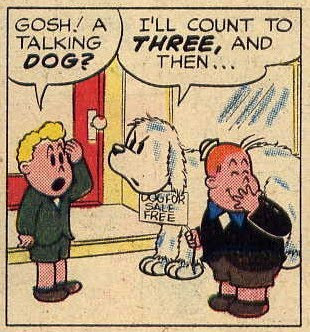 Before he can tell the others, Kort kidnaps him. He leaves a note for Banner telling him to get rid of the FF or he'll never see Rick alive again. So Bruce decides to turn himself into the Hulk again. 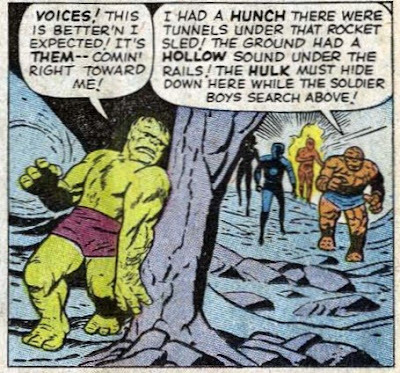 Remember, this is during the era where Stan and Jack were still experimenting with the Hulk's transformations; at one point it was voluntary, at another it was brought on by nightfall. It was only later that they hit on the idea that stress caused Banner to change. 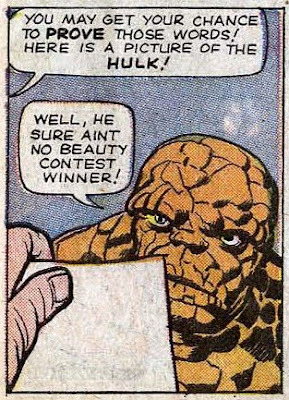 Note as well that the Hulk's vocabulary is a little more extensive than the "Hulk smash!" character of the later 1960s. 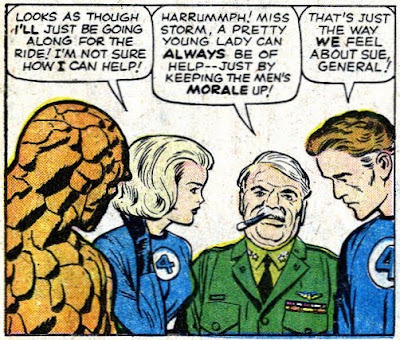 But as you can probably guess from that panel, Sue proves useful for more than just morale-boosting. The Hulk gets away. Comments: Obviously a hugely significant issue in terms of a preview of things to come in the Marvel line. 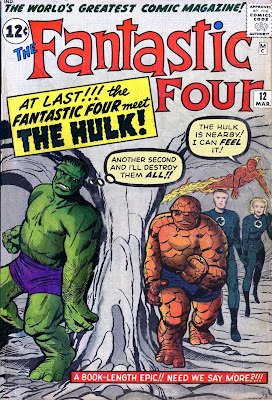 One oddity; the crossover came too late to save the Hulk's own magazine, which saw its final issue come out that same month (March 1963). Incidentally, there was another FF crossover in Amazing Spiderman #1, which also had a 3/63 cover date. 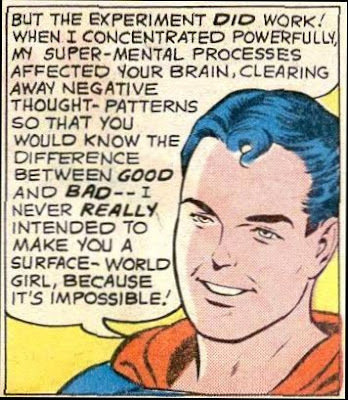 Best Romances of the Silver Age? 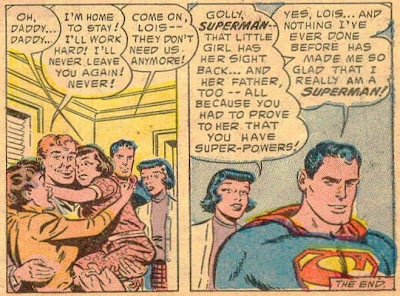 Superman and Lois Lane: A rather tepid romance at best, and it was not, as Mort Weisinger put it, consummated during the Silver Age (although that changed eventually). Batman and ??? : 'Nuff said. Barry Allen and Iris West. 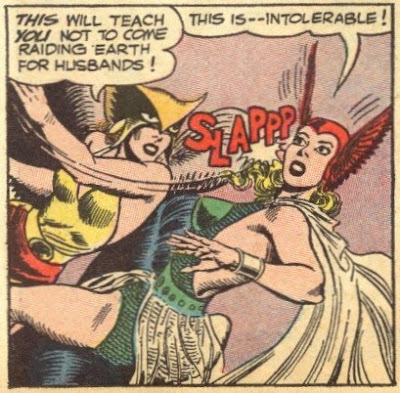 One of several marriages within the Silver Age of a long-dating couple. Lots of good interaction, although Iris could be a beeyatch when she wanted to as well. 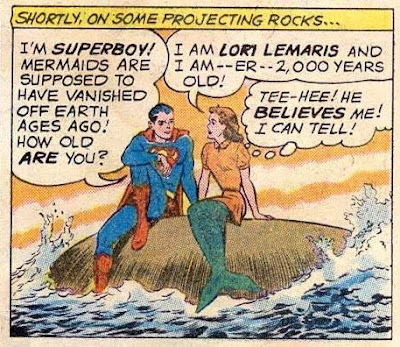 Aquaman and Mera. 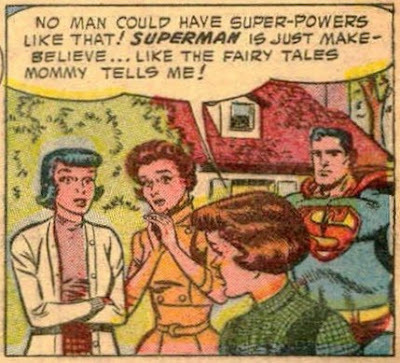 One of the definitely consummated marriages in the Silver Age; they did, after all, have a son. Green Lantern/Hal Jordan and Carol Ferris. It ended badly, and this was always an oddball romantic triangle with Hal competing against his secret identity as I have discussed previously. Ray Palmer and Jean Loring. A solid contender; don't let the ridiculous Identity Crisis storyline distract you. 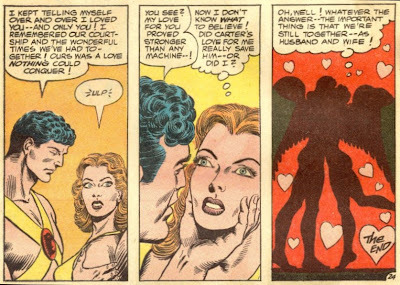 A major reason why Ray fought crime as the Atom was to help Jean establish her practice so she'd marry him. 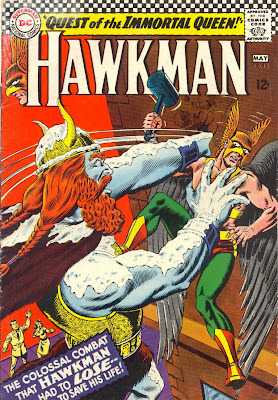 Hawkman and Hawkgirl: Unique situation as the Halls were married when we first met them. Worked well together both in their costumed identities and as civilians. 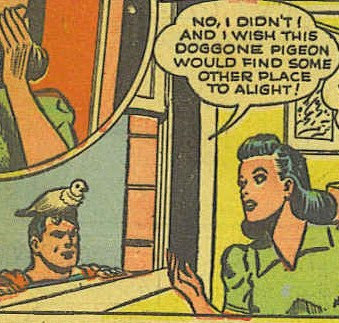 Ralph Dibney and Sue Dibney: Another early married couple, one of the charms of the Detective Comics series was the interaaction between the pair. Reed Richards and Sue Storm. Another rare case of consummated love, as they bore a son as well in the Silver Age. Peter Parker and Gwen Stacy. Ill-fated and frequently tested, their love was surprisingly strong during the late 1960s. Hank Pym and Janet Van Dyne. Like the Dibney's they were not really major characters at the time, but they did marry. Bruce Banner and Betty Ross. They came close to getting married in the Silver Age, but I never really felt a strong bond between the two. Any others? The Marvel characters pretty much turned over all their girlfriends before the decade was over: Karen Page, Jane Foster, Pepper Potts, etc. 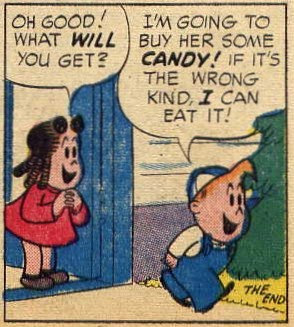 Archie and Veronica/Betty and Richie Rich/Gloria are cute, but not really romance in my book. Adam Strange and Alanna. An excellent romance with lots of interaction, the involuntary separations and even an accepted proposal of marriage. A very strong contender. 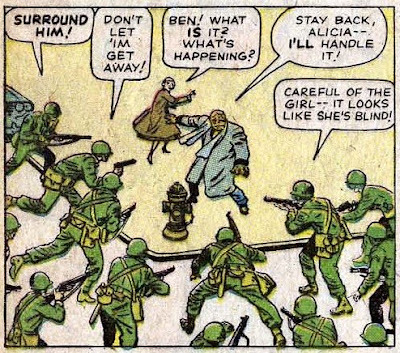 Ben Grimm and Alicia. If we look at a romance as union of yin and yang, this would have to rate strongly. Alicia completes Ben, and softens his hard edges (although figuratively, not literally). Green Arrow and Black Canary. 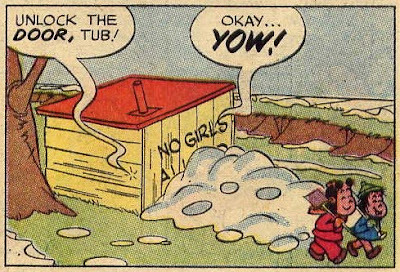 I'd rate this as more of a Bronze Age Romance. Same with the Vision and the Scarlet Witch. Catwoman and Batman. 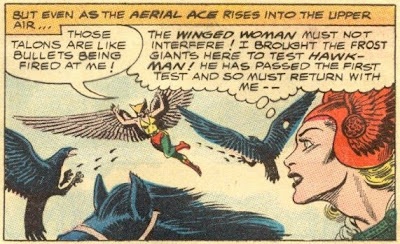 Terrific pick but more Golden Age than Silver; the Catwoman only made two real appearances in Batman during the Silver Age. BTW, on the consummated part, I do think that marriage and children are an important manifestation of love, but I was also being a little puckish; see this post for more. This one took me a bit by surprise. 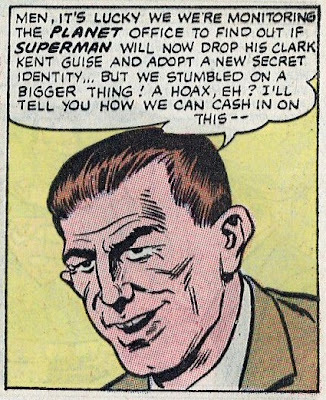 About a year and a half ago, I wrote a post about Action #331 (December 1965), where the story concerned Lois Lane writing an article for the Daily Planet about how Clark Kent was really Superman. 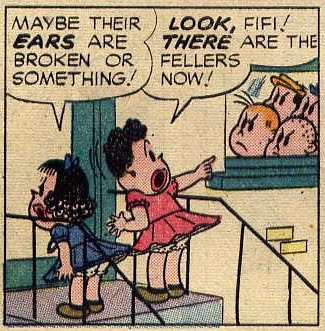 It was intended as a gag, but the pressman who ran off a few copies took ill, and his assistant accidentally ran off the full press run with the headlines. 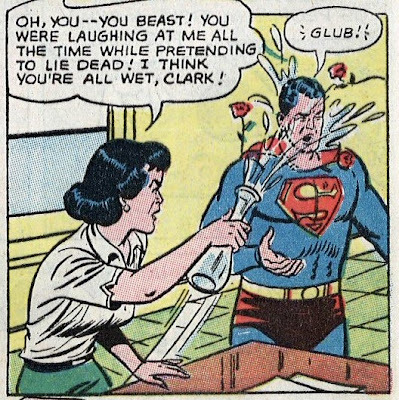 At first it appears that the Planet will suffer, and Lois will be fired, but then Clark suggests that if he pretends to really be the Man of Steel for a few days and then the Planet reveals the gag, readers will forgive them. Inevitably this causes big complications, but in the end it all comes off well. 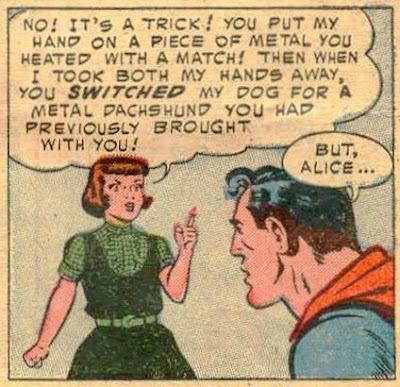 But overall this is one of the more blatant Super-Swipes that I can recall. Update: As requested by longtime blog-buddy Bill Jourdain, I'm including reprint information on these two stories. 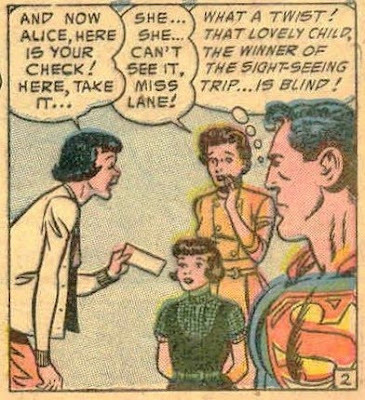 Update II: An anonymous commenter points out that the Superman in the Fifties book notes that the story of the blind girl saved by Superman also appeared on the Adventures of Superman TV show. I found mention of the episode here. 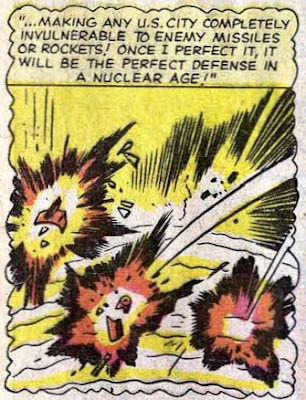 It appeared on TV about a year before the comic book version.